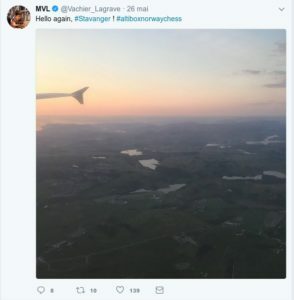 Beyond semantics, it is obvious that Norway Chess is in any event the first great rendez-vous of year 2018 for the world elite. Ten of the thirteen best players are there, only #4 Kramnik, #9 Giri and #11 Grischuk, are missing. As usual, it’s a blitz tournament which served as the drawing of lots ceremony, in order to determine whose players will get five whites and whose will get five blacks. This little game was won by Wesley So with 6/9, while Maxime got the worst place (6th) with 4.5/9, but behind Mamedyarov on tiebreaks. In the evening preceding the beginning of the tournament itself, uncertainty prevailed about Mamedyarov effectively playing, because he was suffering from an intense toothache. It’s the next morning, only a few hours before the launch of round 1, that Maxime learned his opponent would be present in front of him à 4,30pm ! Probably not having completely recovered yet, the Azeri chose to counter the Grunfeld with the modest e3/Bd2 variation, but Maxime opted for a more flexible, though more risky option (6…dxc4 7.Bxc4 Nbd7), rather than going for the principled and logical 6…c5. In order not to become worse, he decided to part with his c5 pawn by 16…Be6!, getting quite a long-term compensation. Without us knowing if it had something to do with his teeth, Shak lowered the temperature, and provoked a draw by repetition. 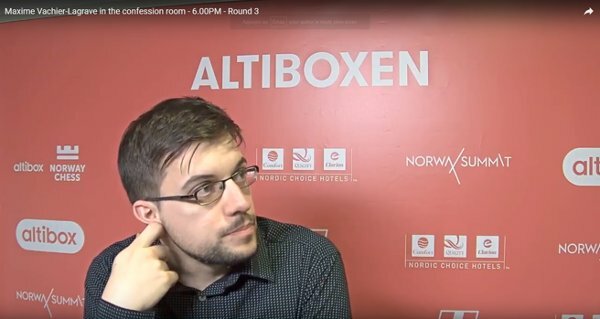 Maxime in the confession booth… (video Norway Chess). Round 2, and second black in a row, against the new strong man of the chess elite, World #4 and unbeaten for 73 games, Ding Liren. The Chinese also opted for a modest variation (e3/Be2), but with the Knight still on b1, so as to discourage the Grunfeld ; 5…d5 6.cxd5 Nxd5 7.e4 forcing 7…Nb6, is indeed not to everyone’s taste. With 6…Bf5 and 7…a5, Maxime immediately took the game to a virgin and theory-free territory. And thanks to a clever arrangement of his heavy pieces afterwards (…Rf7-Qf8-Rd8), he could act in the center and equalize the position with …c6-d5. 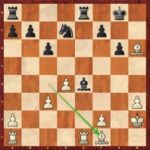 Ding-Liren-Mvl, round 2; 30…e4! forces the draw. The nice 30…e4!, leading to liquidation or a perpetual, sealed a serious and diligent game. 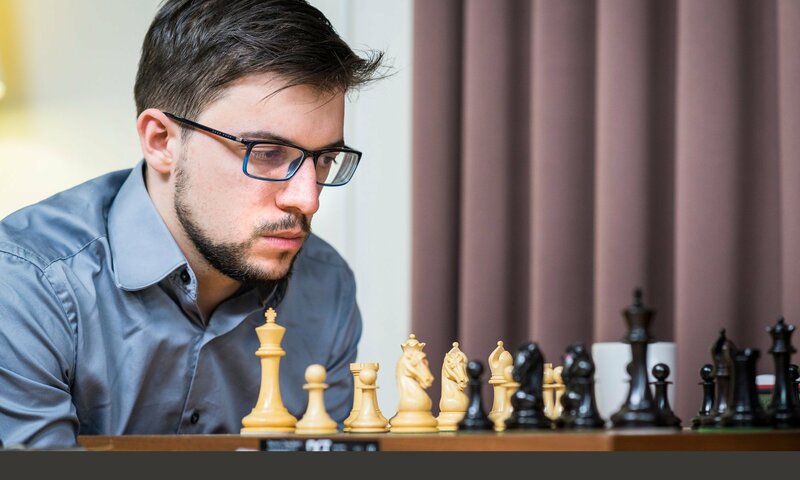 Round 3, facing Caruana’s Russian defense, a weapon which significantly contributed to the American winning the Candidates Tournament, Maxime arrived at the board armed to the teeth… With the Bishop pair and despite a slightly damaged pawn structure, white has a tiny advantage. But you still have to prove it ! Mvl-Caruana, round 3; after 21.Bf1, a position Maxime had already seen at home. As suggested by Caruana during the analysis, white could have taken the opportunity to play 27.a6 (an option black could have avoided on the previous move by playing himself 26…a6 instead of 26…Rd8, but both players didn’t like it because of 27.Bf4). But Maxime who, by his own admission, was preparing to press in a long game, chose another way down the road. Unfortunately for him, he hadn’t anticipated the manoeuver …Ng8!-e7-f5, which forced the exchange of white’s white-squared Bishop, and a transition to a drawn opposite-coloured Bishops endgame. 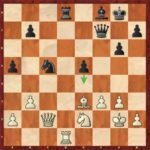 Mvl-Caruana, round 3; 28…Ng8! 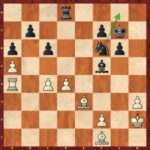 with the idea of rerouting the Knight towards f5, a superb defensive ressource. For the time being, only Carlsen won games (2), and so he heads the field with a one-point lead after only three rounds. After the first rest day on Thursday 31, round 4 is scheduled at 4,30 pm on Friday, June 1st; Maxime will be black against Karjakin. Adgestein For a long time Norway #1 player, and once #16 in the world rankings, Simen Agdestein, 51, is a chess trainer and commentator, when he’s not involved in the Norwegian version of « Strictly Dancing » tv show, or busy singing with a wacky pop music band ! 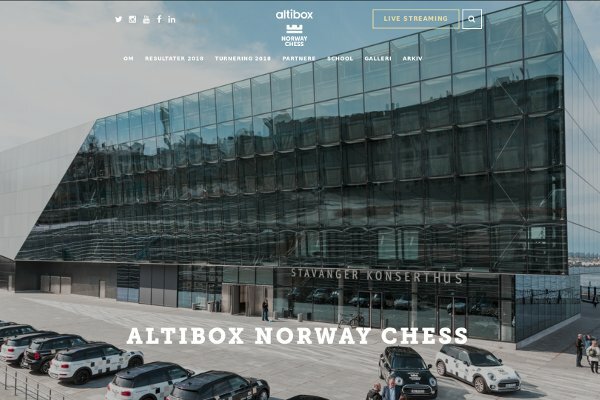 Indeed he does the official Norway Chess commentary on their website. Maybe the younger ones ignore the fact that he became in 1985 the first Norwegian Grandmaster, while turning professional football player in Oslo ! He also has 8 caps in the national Norway team (1 goal), of which one was against the French squad of Didier Deschamps, Eric Cantona and Jean-Pierre Papin, for his last appearance ! (1-1 in the 1990 World Cup Qualifiers). Unfortunately for him, he had to stop instantly his career at 25, after a knee ligament rupture. Is it a unique case in international annals, in so distinct sport disciplines ? Next PostNext And at the end, Caruana wins ! A hell of a weekend! All’s well that ends… badly!